Outlook Express BackUp Expert is an utility designed to easily create a backup file of your email data from Outlook Express, which may easily be restored when necessary. It allows you to backup and restore your messages, accounts, rules, block sender, address book, stationery & preferences. Software failures, power outages or viruses can destroy the data on your hard drives. Why would you have to re-download or even lose all you existing email messages ( together with address book, mail rules and all other email data ) every time your system crashes or you re-install Windows? Now you can use Outlook Express BackUp Expert to create a compressed backup copy of your email data and store it in a safe location. After a crash or a format, simply restore the backup and your data will be back in no time! 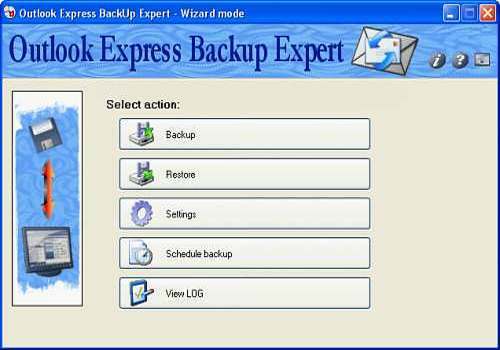 Outlook Express BackUp Expert isn't only a simple backup & restore identity. With it you can easy synchronize emails between two computers. Also you can create new identities in Outlook Express without open it. The schedule feature allows you to backup your important data daily, weekly, monthly or at specified time of day. With our software you can view emails from Outlook Express mail folder or directly from backup file. For each email you can see detailed info, save or print it. For every backup file you can set a password to protect it from unauthorized users. Also you can chose compression level and volume size. After backup process was finished you can write file to CD or send via Internet to a FTP server. It has multilanguage support and two work modes: Wizard and Standard.